Welcome to the new heart of Hocking. 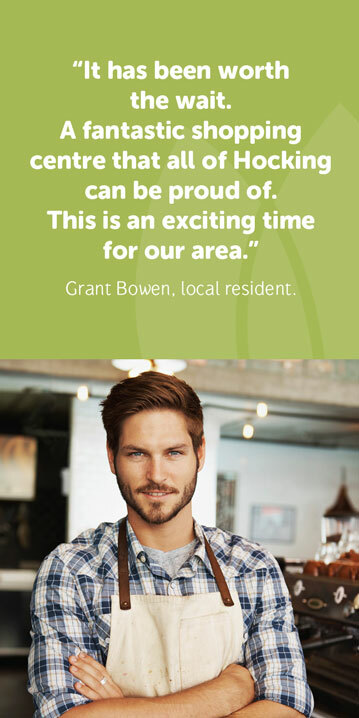 Wyatt Grove is your new neighbourhood shopping centre – we're just down the road. It's the kind of place you can do the weekly shop at Woolworths, meet friends for coffee, grab a meal, get your nails done, pick up the paper or just duck out for some milk. The great thing about Wyatt Grove is that it's big enough to have all the day-to-day things you need, but small enough so you'll be greeted by your first name. Years ago this was the local corner shop. Today it's Wyatt Grove. We're your new corner shops and we're looking forward to getting to know you. Just like any other local resident of Hocking - we're proud of our new home in Hocking. And we're looking forward to becoming an important and active member of the community. Part of that is just getting to know you when you come meet your friends for coffee, grab a meal or do a bit of shopping. But we'd like to do a little more – like support the local schools, sports teams and community groups. We plan to call Hocking home for many years to come. It's why we've designed and styled the new buildings the way we have. We want our new home to look great and last, so we've used quality design and materials, like local stone cladding, a pitched roof and are planting lots of trees on the property. Wyatt Grove is a member of the UNIR Group of Global Companies and is a proud vision of Stanley Ho. With the establishment of its new Perth offices in 2013, UNIR Pty Ltd manages, develops and invests in innovative, profitable and sustainable projects for long-term future growth in WA. 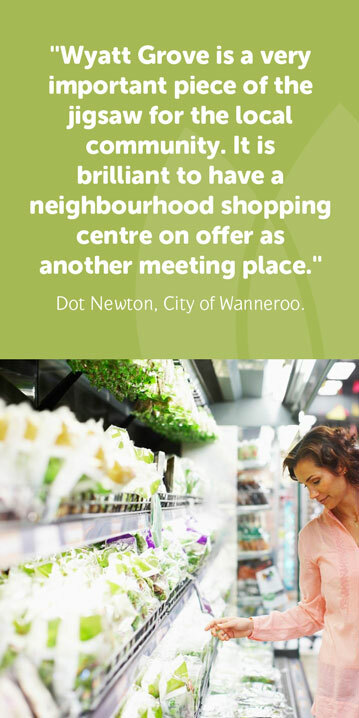 UNIR worked closely with Taylor Robinson architects, Perkins Builders & Donald Cant Watts Corke on Wyatt Grove to deliver an appealing community shopping centre that will stand the test of time. Wyatt Grove Developments Pty Ltd (ABN 12 043 020 340) is a member of the UNIR Group of Global Companies.